WITH the autumn and winter months upon us, writer and researcher Annie Lancel has put together some great ideas for the perfect golf get-away. Whether you are considering options for a mini break or a full on holiday, the travel industry offers many exciting opportunities for the keen golfer. Playing golf in winter can be something of a game of chance, with the weather in areas such as Melbourne and Sydney unpredictable to say the least! Fortunately, up north the weather tends to be much warmer, with the average temperature in Queensland around 16 degrees from May through to September. This is why many golfers now choose to take their annual vacation in winter now, with the warmer climes posing an attractive prospect for the whole family. 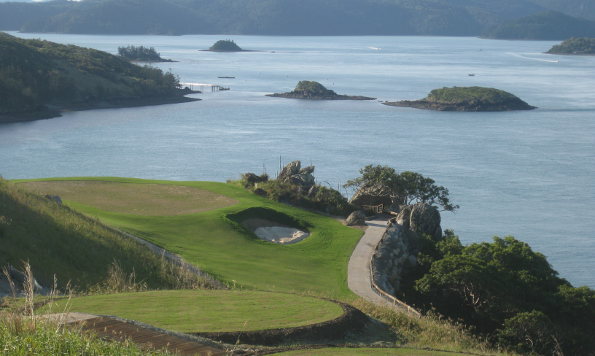 Hamilton Island Golf Club, located on the very edge of the Great Barrier Reef, offers players both spectacular views and challenging holes, being the only championship course in Australia located on its own island. The par 71 course was designed by five time British Open winner Peter Thompson, and visitors have the opportunity to tackle 9 or 18 holes under the tuition of the club’s resident professional – an ideal way to improve your game whilst basking in the glorious sunshine! With holes located everywhere from sharp ridges to steep valleys, this course will certainly prove challenging for beginners and professionals alike. With Australasia now one of the top cruising destinations in the world, one would expect a plethora of different varieties to be on offer for residents of Australia and New Zealand. Surprisingly, one such variety caters exactly to the wishes of golfers, debunking the myth that cruise holidays involve nothing but lying on a sunbed on the poop deck. 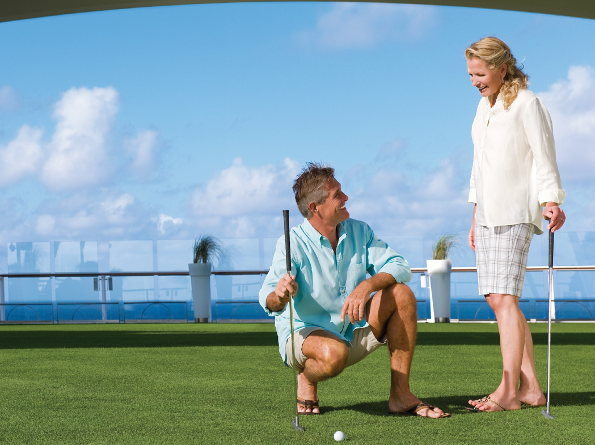 Golf cruises are fantastic opportunities to combine travelling and your favourite sport, with the stopovers in port to see some of the world’s best courses being the only reason to tear yourself away from the on-board driving range! Even better, the usual problems when travelling with golfing gear are negated as most cruise liners provide the majority of equipment for your use. According to iglucruise.com; “Golf cruises carry a good stock of golfing equipment on board which means that travellers need not be burdened by heavy baggage on their holiday. Private and group tuition by PGA golf professionals are available on most golf cruises representing the cream of their sport.” With extensive travelling and some excellent courses all part of the experience, golf cruises truly tick all the boxes for the enthusiastic golfer. Of course, while Australia has plenty and more to offer in terms of golf, this is sometimes not enough for purists who wish to visit the ancestral home of golf. Scotland has largely been credited with the creation of the sport, although many different theories exist, and so is one of the most popular destinations in the world for those seeking to improve their game. Of course, the obvious choice for your visit is the Old Course at St Andrews, with the par 72 course imprinted with the footsteps of legends dating back generations. It is a good idea to remember that, for one day a year, golf is played “backward” on the Old Course, following a right hand loop rather than a left hand loop format – this is a historical reference and can be a little confusing for those unfamiliar with the custom! Visiting the ancestral home of golf can be a daunting thought, but with caddies available who know the course like the back of their hand and vast numbers of visiting professionals prowling the greens, you will certainly be in safe hands. Whether you wish to take your golfing hobby to the next level either at home or away, it is incredibly easy to find options for incorporating your favourite game with your favourite holiday type. With a little help from Australian Senior Golfer, your dream holiday can be only a click away.